Finland is a very metal-loving country, but not a place I associate with speed metal necessarily. But perhaps that impression of mine needs to get corrected -- this is the second Finnish speed metal release I've reviewed this year! 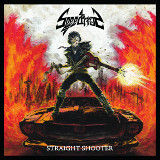 With a name like Speedtrap and a cover depicting a demented-looking, leather-clad figure using a guitar as a machine-gun, it's pretty easy to anticipate what style of metal to expect, and these guys don't disappoint at all with Straight Shooter. It's fast, heavy, and modern enough that it doesn't sound like they cloned their influences as much as one would expect. Hearing Jori Sara-aho's vocals, I actually wondered for a second if Harbinger's Matt War had somehow moved to Finland. Sara-aho has the same breathless, fast-paced vocal delivery as that vocalist, with an endearingly garage-band quality to it; in contrast to that, Ville Valuo's guitar work, now backed by second guitarist Jaakko Hietakangas, is rough, saw-edged, and blazingly fast. Even with a fairly simple central riff for songs like Torches Ablaze, so much is going on that it's kind of hard to make out everything right away, with ripping solos flung gratuitously at the listener, but Running Rampant uses a more traditional song structure with a two-guitar attack, and one of my favorite songs on the CD, Eyes for Conquest, slows the pace down a bit to a steadily pounding gallop, adding a jagged-edged melody. One fault I find with the production is its treble-heavy mix. So much revolves around Valuo and his guitar, and he's riffing so much on the thinner strings, that the bass gets overlooked and there's not really much in the way of strong low notes to balance the mix. In some ways this makes the music more authentic-sounding, though, like a garage cassette demo from the mid-80s, with thrash-style riffing going so fast on Serve Your Masters that it's almost manic. The two-guitar solo tradeoffs are exercises in old-school shredding and the drums are going so fast most of the time that the speed rivals some of Gama Bomb's short tracks, with Sara-aho finally managing to hit a falsetto scream by the end of the song -- I wondered when he'd be able to get there. Other tracks are stronger than the first ones as well. The title track makes for a good speed metal song, with a fairly straightforward, Discharge-style riff played mid-tempo and with the soloing sharper and with a cleaner attack than the band manages on most of the album, and Heavy Armor bucks the trend of shrill, light riffs by adding some much-needed low pitch to its swinging beat -- even Sara-aho sings lower a good portion of time on this one, making it sound much better. It seems like Speedtrap, for all their obvious technical chops, are at their best when they're not quite so...well...speedy. Blindingly fast thrashers like Savage the Prey are impressive, but this is a band that shines more when they're not trying so hard to live up to their name. Straight Shooter comes across to me as an album showing technical brilliance hamstrung by flaws in reproduction. Though the clear focus on face-melting guitar prowess to the exclusion of almost everything else sometimes becomes a handicap, this is still a decent listen, and there are plenty of times on the album when the band overcomes their difficulties and achieves their goal perfectly.